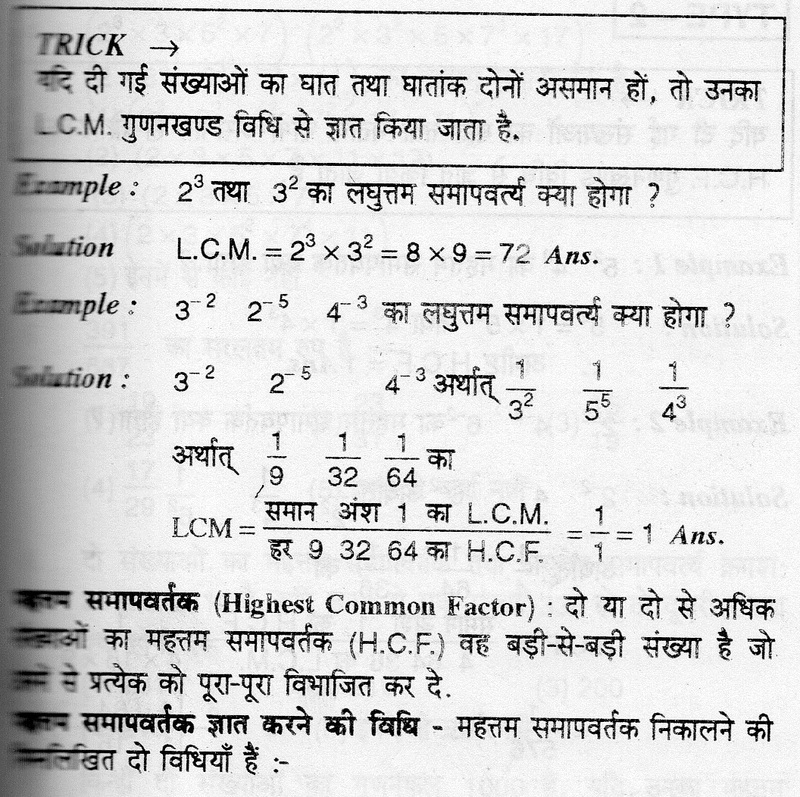 In this post we are going to share some most important short tricks of LCM and HCF questions. 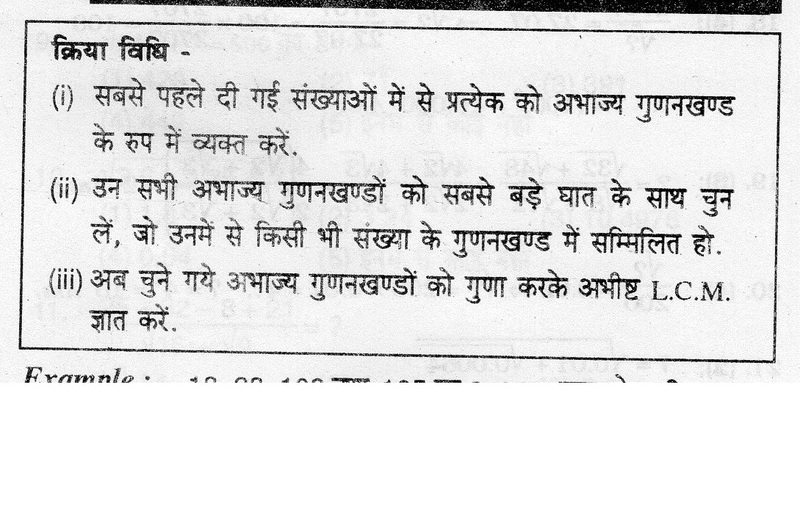 We are also share short tricks in Hindi as well as in English language. 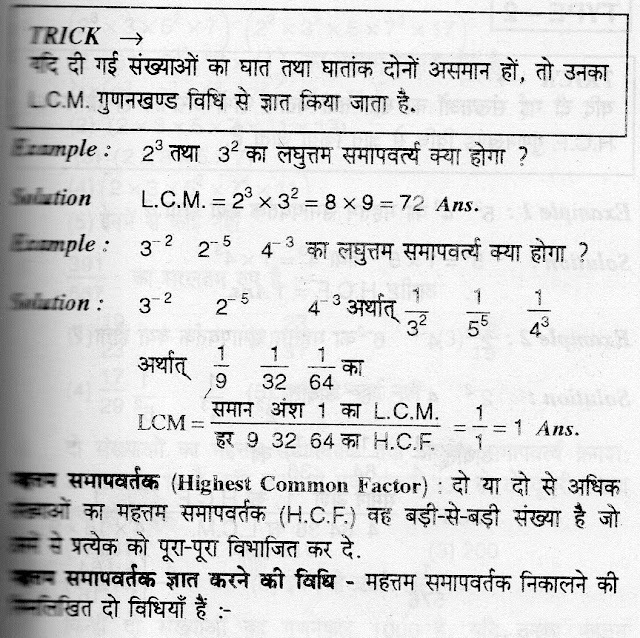 These short tricks is very halpful for those candidates who are participating into various state and national level competitive exam. 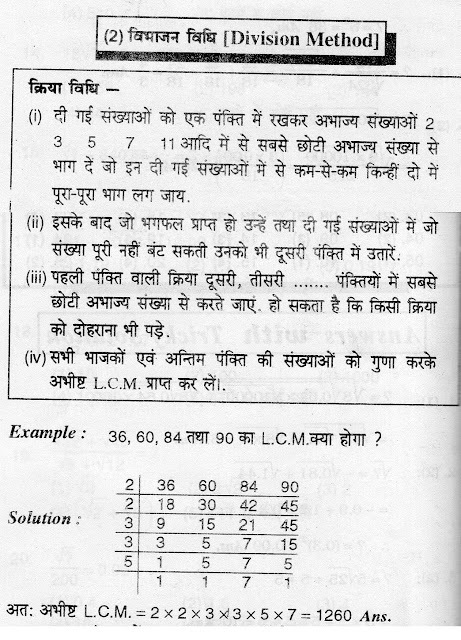 If the base of given digit is same and power is not same or different,then LCM will be of the maximum power of the number. 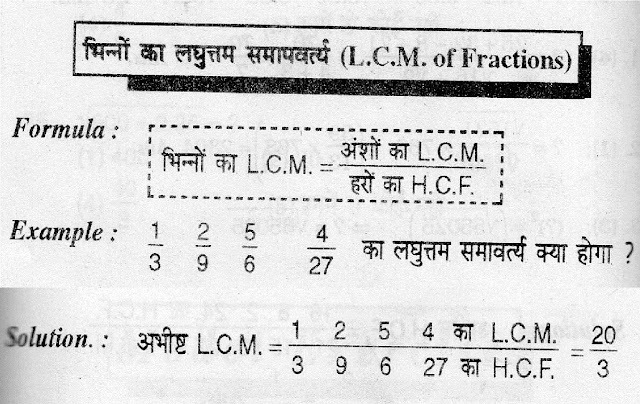 If the power and exponent are not same or different, then its LCM will get by factorization method. Find the largest number of four digits exactly divisible by 12, 15, 18 and 27. Required number must be divisible by LC.M. of 12, 15, 18, 27 i.e.. 540. On dividing 9999 by 540, we got 279 as remainder. Required number = (9999 — 279) = 9720. Find the smallest number of five digits exactly divisible by 16 24, 36 and 64. Smallest number of five digits is is 10000. Required number must be divisible by L.C.M. of 16, 24, 36, 54 i.e., 432. On dividing 10000 by 432, we get 64 as remainder. remainders 14, 19, 29 and 34 respectively. Here, (20 — 14) = 6, (25 — 19) = 6, (35 — 29) = 6 and (40 — 34) = 6. Required number =(L.C.M. of 20, 25, 35, 40)— 6 = 1394. 3, but when divided by 9 leaves no remainder.
. L.C,M. of 5, 6, 7, 8 is 840. Required number is of the form 840k + 3. Least alue of k for which (840k + 3) is divisible by 9 is k = 2. Required number (840 x 2 + 3) = 1683.
then at what time will they again change simultaneously? Interval of change = (LCM. of 48, 72, 108) sec.= 432 sec. So, the lights will again change simultaneously after every 432 seconds i.e., 7 min. 12 sec. Hence, next simultaneous change will take place at 8: 27: 12 hrs. Firstly show the given digits into indivisible multiplication. Select the indivisible multiplication with the biggest base, which is inserted in any multiplication digit. 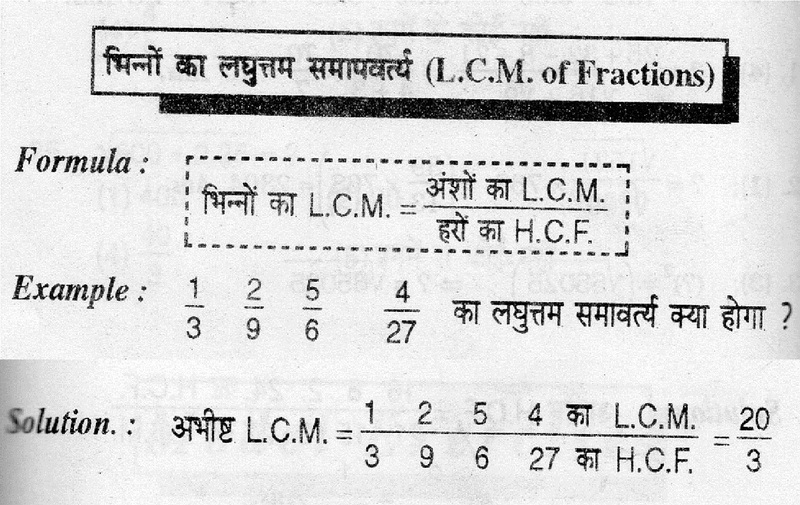 Now multiply the selected indivisible multiplication and get the LCM. 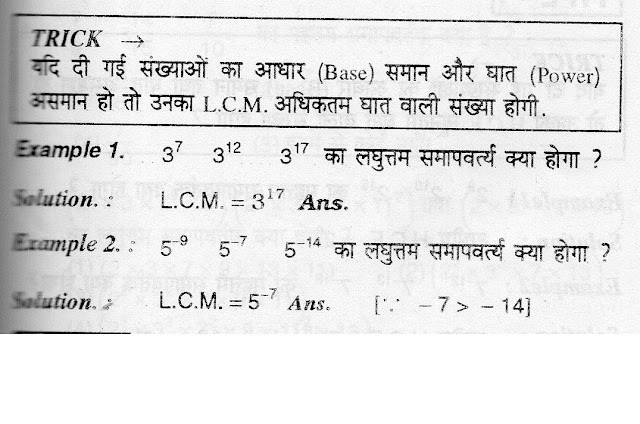 EXAMPLE- Find the LCM of 18,28,108 & 105. Note:- Here, The biggest base number of 2 & 3 is 2^2 & 3^3 , and second indivisible multiplications are 5 & 7. After that write the remaining quotient and numbers which are not totally divided in next row. Repeat the first step again and again. It is possible that we have to repeat any process. By multiplying all the divisor we will get the required LCM. Example: Find the LCM of 36 , 60 , 84 & 90 . To find out the LCM of given decimal digit , find out the LCM of hole relative digit, then drop the decimal from the right side of the digit as it was earlier in the digit. 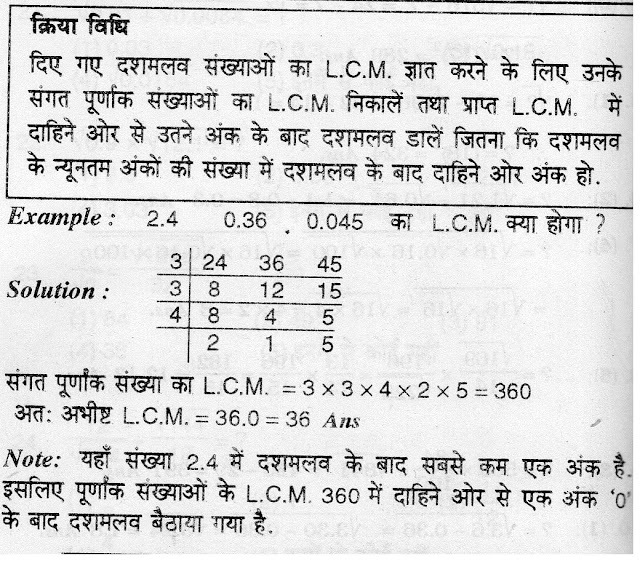 Example: find out the LCM of 2.4 , 0.36 & 0.045 . Note:- here in 2.4 there is one number after the decimal because of this in LCM 360 decimal is dropped from the right side before 0. 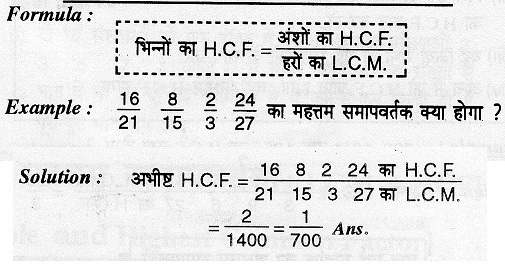 If the base of given digit is same and power is not same or different, then HCF will be of the maximum power of a number. Example 1 : Find out the HCF of 5^2 & 4^3. Example 2 : Find out the HCF of 2^-2 , 4^-3 & 6^-2. Firstly show the given digits into indivisible fractions. The fractions which are present in all digit, the product of that fractions will be required HCF. Example: Find HCF of 28 & 32. From the given digits firstly divide bigger number by smaller number. Then from the reminder divide it by divisor, hence we get next divisor. Repeat this process till reminder will be zero. So that the last divisor will be required HCF. Example: find the HCF of 493 and 928. 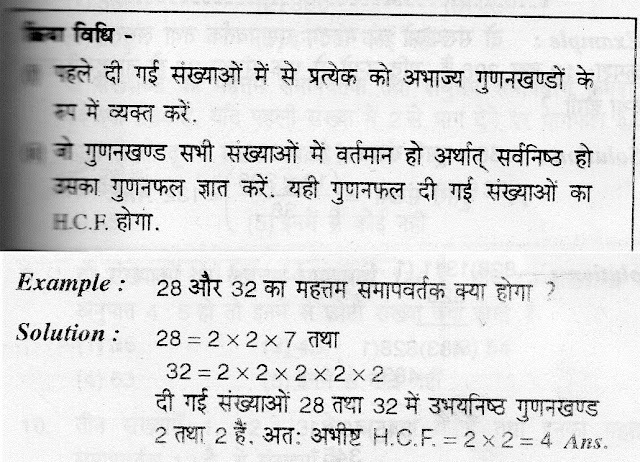 Firstly find out the HCF of any two numbers by continuous division method. 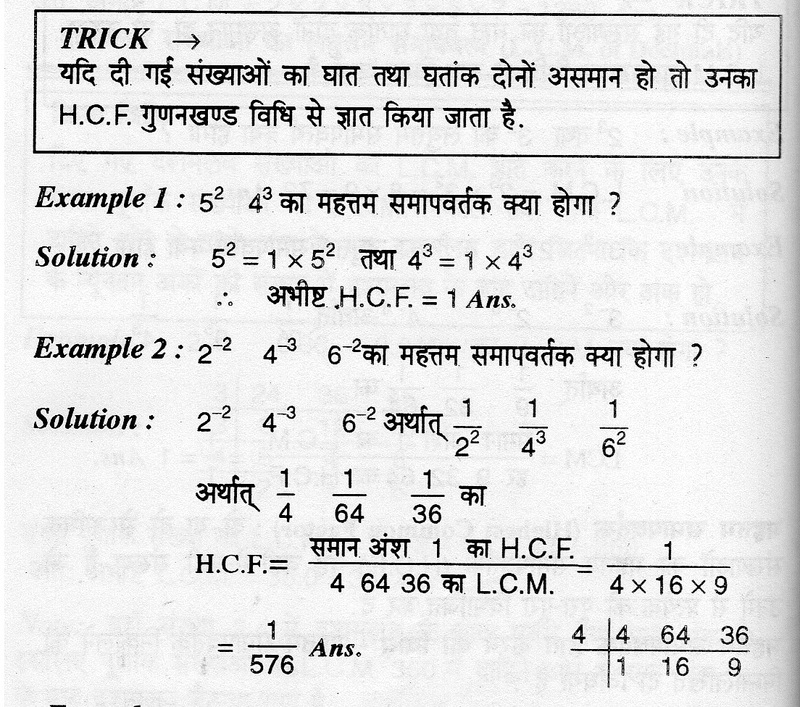 Then find HCF from that HCF which we get by the first step and remaining of given digit. Repeat this process with all remaining digits. At last, the HCF we get will be the required HCF. Example: Find the HCF of 828 , 1311 & 1955. To find out the HCF of given decimal digit , find out the HCF of hole relative digit, then drop the decimal from the right side of the digit as it was earlier in the digit. 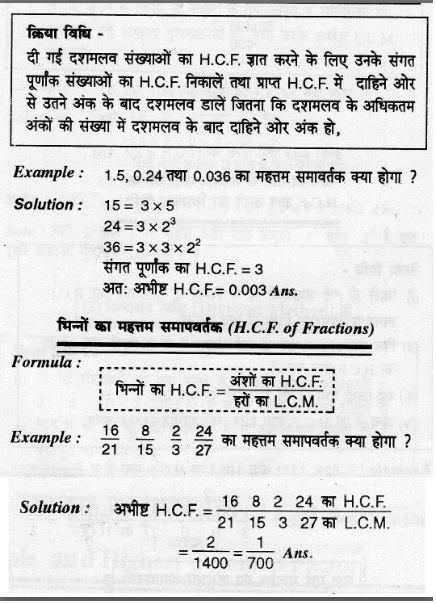 Example: Find out the HCF of 1.5 , 0.24 & 0.036. Let the numbers be 2x and 3x. Then, their L.C.M. = 6x. So, 6x = 48 or x = 8. The numbers are 16 and 24. Hence, required sum = (16 + 24) = 40.
ab = 3. Now, co-primes with product 3 are (1, 3). Let the numbers be 3x, 4x and 5x. Then, their L.C.M. = 60x. So, 60x = 2400 or x = 40. The numbers are (3 x 40), (4 x 40) and (5 x 40). Hence, required H.C.F. = 40. Explanation: Clearly, the numbers are (23 x 13) and (23 x 14). Larger number = (23 x 14) = 322. एक कमरा 15मीटर 18सेमी लम्बा तथा 25मी 07सेमी चौड़ा है। इसकी छत के निचले भाग में कम से कम कितनी 2फीट लम्बी व 2फीट चौड़ी टाइलें लगेगी?